Friday we met up at the Williamsburg antique mall and did some antiquing and had tea lunch together. That night we ate at the Blue Talon Bistro (so yum), one of my favorite restaurants in Williamsburg: so yummy and so full in this photo. 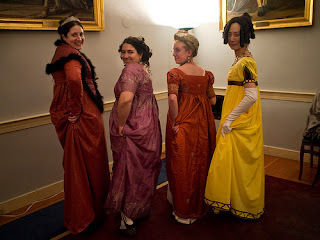 Saturday evening was late 18th century costumed tavern dinner at Shield's Tavern in CW: Samantha (the couturecourtesan) and Emma (friends from CW) joined us, and we had a lovely evening eating, drinking and talking about costumes, events, travel, fabric and life! It was super fun to catch up and get to know these lovely ladies a little better: thanks so much for joining us and hope to see you again soon! Jess in her new lovely rose silk gown! Sunday we had a leisurely tea leftovers breakfast, and then we did some historic shopping, including a trip to Tarpley's, Prentis, Post Office, Mary Dickinson, and Greenhowe. They even had a small ice rink set up on one end of historic CW: so cool, maybe next year, eh?! Then a quick visit to The Williamsburg shop, the Cheese Shop, then on to Aroma's for lunch before heading home. Isabella and I also made a stop at Yankee Candle factory outlet (her favorite) before heading out of town. Current fabrics for sale at historic CW Mary Dickinson shop! They even had an nice rink in historic CW this year, so fun! 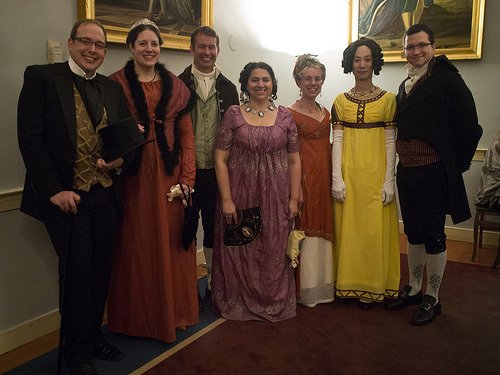 I missed those of you who couldn't join us this year, and definitely plan to do this again next year! Jan-Mar are the slowest (and COLD-est) time of year in Colonial Williamsburg, and so they have quite good deals, so we'll plan on going again for the 3rd Annual around this time next year! A wonderful and relaxing weekend with friends! First, the first weekend in January, I attended a yearly Holiday Tea - each year the theme or time period is different, and the hostess/s try to keep it relaxed and inviting since it's usually the last event just after Christmas or the first event of the new year. 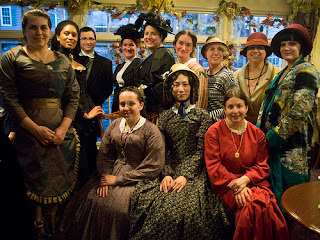 This year the theme Isabella chose was a really loose Victorian period, stretching all the way from 1830-1920. 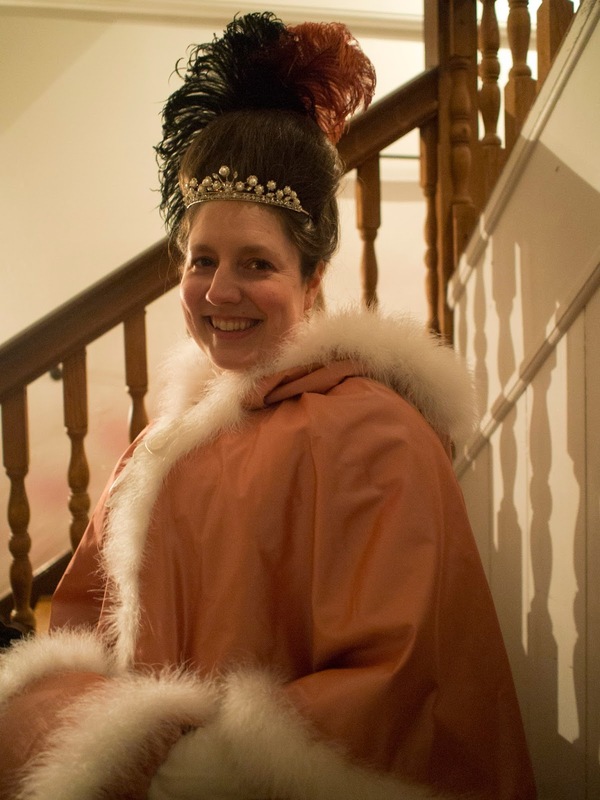 I decided to wear my early turn of the century (Edwardian) day outfit that I wore to Winterthur two years ago, with a revamped skirt, my recently finished black silk mourning cape and a new hat! First, I did some fixes on the skirt and added snaps, ties and some other finishes. Then I took a vintage hat that was probably from 1940's-1950's (could be earlier), and covered it with antique feathers, a bit of marabou, some black silk ribbon, and (I think this is hilarious), one of my Anne of Green Gables black 'pouf' sleeves from my homemade (mom made) sophomore prom dress. The vintage hat straw was not in fantastic condition, so other than a few stitches to secure the band in again, I just pinned this hat together and wore it that way. We met for tea at a tearoom in a little town by the water south of Baltimore, and this was the first time I'd been to the tea room, and likely also the town (unless I went as a little girl and don't recall). The town was busy, with all these cute little shops (no time to check them out) and it was cold and parking was a pain, but the tea room was run by a staff who was welcoming and gracious, had a lovely big table for us in the upstairs, and we were served absolutely delicious tea food, including a cinnamon 'scone' (more bread cake then scone) but absolutely yummy and I'm still dreaming about it! I sat in the back corner with Isabella, so no possible way to move about or get up, so I only took a few iPhone photos, and I missed having conversations with folks on the end, but I did have a wonderful time, chatted with friends and met 2 new costumers, and chatted with a few friends more outside and in the parking lot after, so all in all, a very successful and fun day! Thanks so much, Isabella, for planning such a fun and well attended event: seriously loved it! Second, my honey and I got tickets for the Riversdale Twelfth Night Ball and Supper which was the following weekend, and it was a Regency ball. 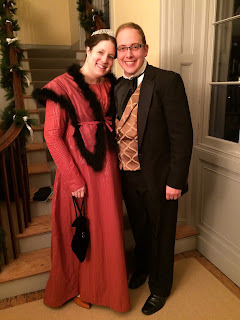 My honey wore his cobbled together gentleman's outfit (a quick vest, some thrift store finds, a walking stick and an antique top hat to finish it off) and looked very dapper. I wore a drawstring dress I made for Regency pumpkin tea about 7 or 8 years ago from $2 a yard sale 98% cotton 2% metallic silver thread from JoAnn's. 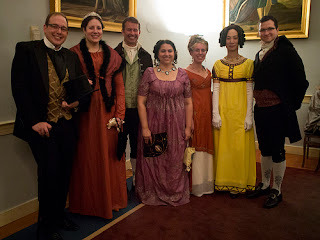 I also wore my recently finished Regency 'fichu' out of burgundy silk and black marabou, securing it around my waist with ties. Riversdale were wonderful hosting again, with a delicious light supper including gluten free and dairy free options for their guests, with much of the delicious vegetables and fruits grown in their garden, including most of the berries from the berry compote desert. It was delicious, and they were gracious in their welcome to their guests and in the way they served the food and drink. 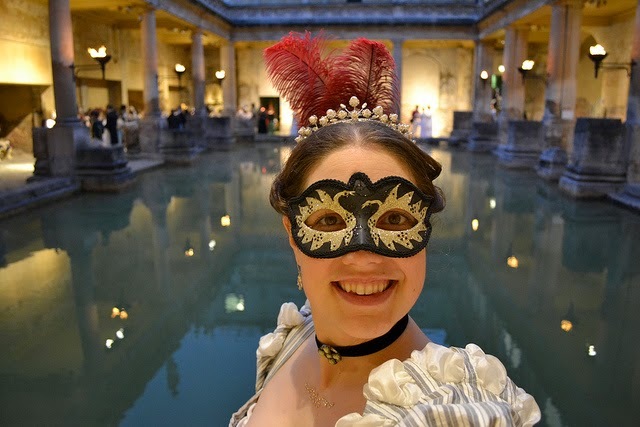 It was lovely to wonder the halls a bit, dance with my honey and with my friends, and also partake in the yummy repast they provide that evening. Definitely a place to come back to many more future balls! 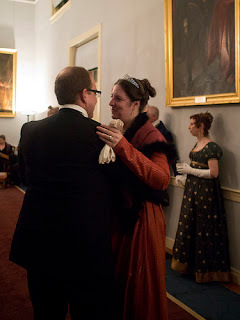 My honey and I dancing (courtesy InTheLongRun): it was such a fun night. Thanks Gloria, for letting us all know about the ball! Hopefully we'll get to do more of these, what great events to start the year off!